Iowa BarnstormersHead Coach and Director of Football Operations Mike Hohensee announced the assignement of two more players to the team’s 2013 roster on Tuesday. Joining the club will be FB Kai Brown along with WR Josue Paul. Each of them has been assigned to Iowa with 1 year contracts. Brown (6-3, 250) most recently played in the UFL for parts of three seasons with the California Redwoods / Sacramento Mountain Lions. He is an extremely versitile player having played FB, HB & LB along with starring on special teams. Prior to turning pro, Brown played for 4 years (2005-08)at Brown University where he played LB and DE. During his junior season he finished 2nd on the team with 6.5 sacks. 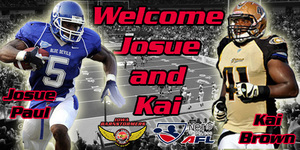 Paul (6-1, 218) comes to the Barnstormers after spending time during the 2012 season playing in both the AFL and CFL. In 3 games last season with Milwaukee (AFL), Paul recorded 18 catches for 269 yards and 5 touchdowns, 4 of which came against Philadelphia in week 9. He signed with the Kansas City Chiefs as a free agent in 2011,before being one of the last players released. In 38 career games at Central Connecticut University, Paul caught 103 passes for 1563 yards and 10 touchdowns. He also returned 4 kickoffs for scores.